- Added Game Delete module, accessible through the new Extended Game List menu . - Added support for External Split game Copy / Import (.ISO / .BIN / .ENC) to internal drive. - Added feature to Filter Encrypted / Decrypted (ISO / BIN) on the Game List for organization purposes. To switch filters press L1 / R1 while on the Game List. - Added Extended Menu on the Game List, accessible by pressing the button, this avoids having to assign buttons to every single action. This menu will be useful for future features . - Added a Prompt for users when making an external game active, it will ask if they want to import the game internally, or just set it in the Placeholder temporally. When the game is imported you will be automatically taken back to XMB so you can run the Placeholder. - Added control-flag as recommended by Deank to RELOAD.SELF build process, this should solve file permission / access problems. - Added Memory Card slot selector module to assign any Memory Card at "/dev_hdd0/game/PS2L00123/USRDIR/SAVEDATA" as SLOT 1 and SLOT 2. They can have any name you like, for example: "Final_Fantasy_X.VME". - Added module to use optional custom PIC0.PNG and PIC1.PNG if they are provided by user on each game directory. - Updated covers module to look for covers named as "SLUS_000.00.PNG", "SLUS-00000.PNG" and "SLUS_000.00_COV.PNG", if you named them in any of those formats, they will be recognized and displayed. - Added code to look for .ISO / .BIN files while scanning (/dev_hdd0/PS2ISO) (/dev_usb00x/PS2ISO) and list them on the Game List. - Added code to encrypt .ISO / .BIN files from PS2ISO directory and automatically create the proper directory structure. - Added module to acquire PS2 Game Titles from the database distributed with @aldostools ps3tools (ps2titleid.txt), thanks to @aldostools for the database. - Added code to get proper Game Title ID from .ISO / .BIN (SYSTEM.CNF), this is used when encrypting and when listing games. 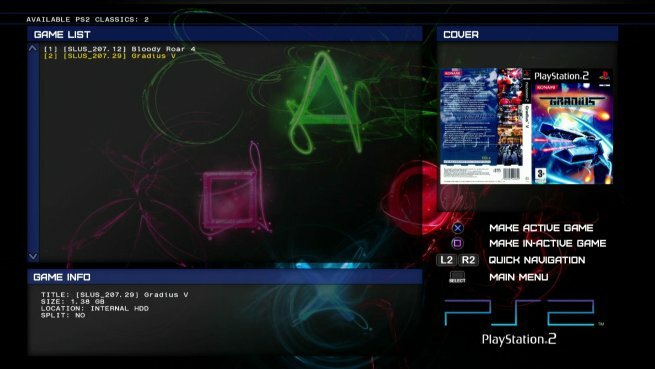 - Modified PS2 game Cover handling code to use the new Title ID modules, covers should be named as in: "SLUS_203.12_COV.PNG". - Covers are now located at "/dev_hdd0/game/PS2L00123/USRDIR/COVERS". - Added auto-export module that will convert and make both selected SLOT 1 and SLOT 2 VMEs available on XMB's Memory Card Utility (You need to have 2 memory cards on XMB called MC1 and MC2 for this to work). - Added / verified VME (Memory Cards) decryption module to PS2CM, the resulting VMC (VM2) was tested on the XMB and worked fine. Note: By adding auto-export VME feature, the selected VME for SLOT 1 and SLOT 2 will get decrypted as VM2 and copied to /dev_hdd0/savedata/vmc/SLOT1.VM2 and /dev_hdd0/savedata/vmc/SLOT2.VM2 each time you set a game active in the PS2 Classics Placeholder. After being brought back to XMB you will be able to check out your saved data by going to Game->Memory Card Utility. - Added PS2 ISO encryption via PS2CM (had to port / modify ps2classic code to be compiled on PS3). - Ported / updated my own LIMG patcher code and it will properly check, patch or append the LIMG data segment to the PS2 ISO as needed (If LIMG segment is already found, the module will overwrite it to ensure it is correct). This module will properly handle both "ISO9660 / MODE1 / 2048" and "ISO9660 / MODE2 / FORM1 / 2352". - Added progress bar display for PS2 ISO encryption module. - Added check for correct PS2 Classics Placeholder Content ID on any selected game ISO.BIN.ENC, this will avoid the use of incorrectly encrypted / converted games. - Added module to make backups of VME (Memory Cards) to "/dev_hdd0/PS2VME_BKP/" on PS2CM boot and exit for security purposes. - VME files will be now linked and not copied to system directory, because of this, save data will be always in synch. * Verify if user have created MC1 and MC2 on the XMB for the Memory Card auto-export feature. * Verify if /dev_hdd0/PS2ISO directory needs to be created for External game import / copy. * Verify if a system directory at "/dev_hdd0/home" needs to be created for PS2 VME files, if it doesn't exist it will be created with the proper files inside. * Verify if the application can actually write to the system directory. * Verify if PS2 Classics Placeholder is properly installed. * Verify if PS2 Classics Placeholder has unneeded files for some reason (SAVEDATA, CONFIG, ...) and remove them to avoid any possible conflicts. * Verify if the current installation of PS2CM has missing files or is corrupt. * Verify if there is a Last Active game with missing files at PS2 Classics Placeholder directory. * Remove PS2 Classics Placeholder System memory cards when there is no game Active in it. - Modified the way VME (Memory Cards) are handled, now it will use only 2 VME for all games, you will be able to have up to 10 VME to select from, and just 2 of them can be used for SLOT 1 or SLOT 2. - Games just need to have "ISO.BIN.ENC" at their respective directory structure (/dev_hdd0/PS2ISO/[GAME_ID] GAME_TITLE/...).